No matter the occasion, there’s always a reason for a good party. And what’s better than a karaoke night? If you haven’t tried it, you’re missing out a ton of fun. Today we’re testing and reviewing several models in our quest to find the best karaoke machine currently on the market. Stick around, crank up the volume – soon you can pick the perfect one and make a party! If you’ve ever been on a Karaoke party, you know how amazing it can be. The atmosphere it can create (especially when you add some light-show and drinks) in your own place, combined with your friends, can be amazing. The combination of well-known hits (that you can choose) without spending money on each song, and the familiar environment of your place is truly something different. There’s no real karaoke aficionado without a home karaoke system. There’s the privacy/being shy issue as well, where you won’t be embarrassed to get to the spotlight, neither need to dress up for it. There’s nothing better than a private pajama karaoke party! Beside these great benefits, a karaoke machine will bring you increased breathing capacity and efficiency, stimulate your brain, boost your happiness hormone production, enhance your brain function and build your confidence. Improved memory, strengthened voice, and more music in your everyday routine are the bonus benefits that impact our lives. 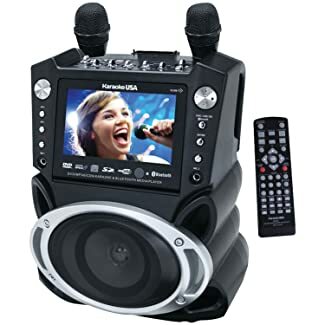 How To Choose The Best Karaoke Machine? The market is flooded with various manufacturers and their models, including many different variables and possibilities. The competition is tough out there, so as a shopper, you have to get informed about the thing you want to purchase. What do you want from the machine? If you’re an occasional singer, and want to use it for a family entertainment, then you don’t need something big and fancy. On the other hand, if you want to host parties and have amazing time with a bunch of your friends, you need stronger sound, a display for lyrics, multiple microphones for duets and contests, and features like audio enhancements. As a beginner, you should understand the karaoke formats first. CD+Gs – The most common format used on the classic karaoke machines. A single CD usually delivers up to a dozen of songs + graphics. MP3+G – Karaoke music converted to the most recognizable audio format today. Can be stored on any hard drive, and played on a computer or any player. The Karaoke Cloud – Used in modernized karaoke machines, no need for physical media format. Requires a monthly or annual fee, brings thousands of songs to users everywhere with an internet connection. These systems come with everything you need as a single product. They include a player, mixer, and amplifier in the same product. The all-in-one systems come in two variables – some come with a display for graphic content, and others require a connection to a television or external speakers. Their advantage is that with one device, you’re set to go – no need to buy additional equipment. The second type of karaoke system comes with separate player, mixer, amplifier, microphones, and speakers. They usually have to be connected to the TV or computer to display the graphics. These systems are usually more expensive, as they bring the more sophisticated components into play. The Block Rocker is, as its name implies, a robust system looking like a guitar amplifier. It comes with a microphone, 50 watts of sound power, rubber-protected corners and big and reliable power bank which can charge your outside devices while playing your music. The ION Audio Block Rocker weighs 24,6 pounds, which is quite heavy for a portable karaoke system. The first thing to notice on the front side is the big metallic grille, manufacturer’s logo, and a set of buttons and adjustable dials. It has a radio function, and a small display where you can read the battery level, current connectivity status, and radio frequency you’re listening. Speaking of connectivity, the Bluetooth 4.0 will ensure a wireless synchronization with your audio devices. The auxiliary audio jack and microphone jack are there to supply singing and instrumental needs. This system brings a lot of functions and possibilities to your parties and enables an iPod dock (which isn’t of highest quality). The system itself doesn’t have any graphic features, which means you’ll have to connect your player or iPod to an external display and run the karaoke app to have the full experience. On the other hand, there is an ION Block Rocker App available on both Android and iOS to enable synchronization and graphic content for your favorite tunes. 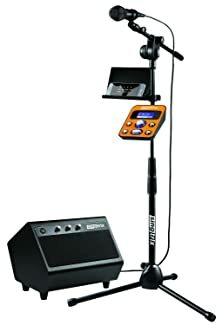 SGTX1 is a modern, multi-functional, and high-quality home karaoke system that comes from Singtrix, creators of a worldwide phenomenon Guitar Hero. A bundled package includes multi-part microphone stand that includes a main processing unit and a place for a graphic element which could be your phone or iPad – no graphic element included. The big speaker comes with 40 watts of power, somewhere around 15 pounds, basic design and 2.1 sound. The system is built very well, with quality materials. The main star of this karaoke system is the processing unit – the advance mixer that provides over 300 sound effects. It will improve your singing a lot and provide numerous options for different scenarios when playing karaoke. This amount of available effects might be a drawback as well, since you’ll need hours to go through them all and find the most comfortable ones for your preferred songs. Luckily, the favorite function is there to help you out – just hold the mic volume button for 4 seconds, and it will memorize it. With some amazing effects and back vocals, the mixer can make you sound like a superstar. Duo & Trio effects are available as well, which will make your parties a hit among your friends (you’ll need an extra mic for that, available at manufacturer’s website). GF830 is a small, but powerful and functional karaoke system. Out of the box, it comes prepared for the party or transportation. It’s small enough for a portable karaoke system, yet it packs a power punch and considerable amount of features. This all-in-one system supports cd media such as audio cd+g, dvd+g, mp3+g, and reads all files from the USB port and SD card slot as well. The front face features a big speaker, packing 15 watts of power output, a 7-inch screen for graphic content, and black design with silver buttons and two microphone jacks. The system comes with two microphones and a CD with 300 pre-recorded songs out of the box, enabling fun karaoke duets in an instant. GF830’s playback is controlled on the front panel, and audio is manipulated from the top side, where several knobs can be found. Two microphones are attached on the back, alongside with a portable device cradle, which isn’t reliable. The back of the device contains two sturdy handles and audio jacks for outer music sources and TV’s allowing for a big screen karaoke experience. 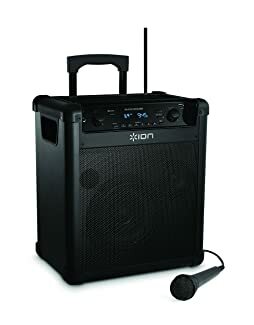 Overall, this is a handy, well-made portable karaoke system that will provide a great time with his functions and maneuverability. The sound is decent as expected, but nothing fancy. 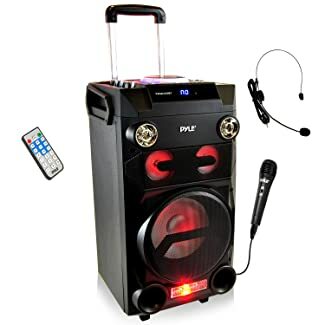 From Pyle we get a portable karaoke machine setup that packs some serious power, portability, and various functions. Be ready to have some fabulous parties with this bad boy, since it packs a light-show which synergizes with karaoke entertainment flawlessly. For ones who wouldn’t like to have a light-show turned on all the time, the good news are that you can turn the lights off. The device is big (14×24,8×14,5 inches, 22.7 pounds), black, and packs a big speaker below the central mixer unit on top. The portable design includes wheels and telescopic handle for easy maneuverability. A small LCD display on front will show you the current status of the machine, and the top side is where everything is happening. It looks like a small DJ booth, with many knobs, buttons and levers for users to combine for the maximum enjoyment. 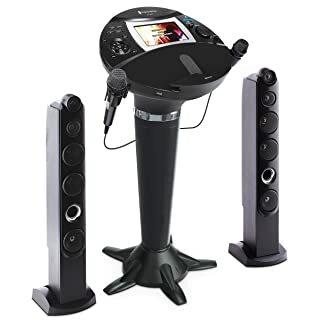 This karaoke system includes a wireless microphone, which is a great thing compared with other models reviewed today. The system can play many formats through USB and Micro SD card readers. There are two microphone jacks, several modes and volume, echo, bass and treble knobs for you to utilize. Packed alongside with the machine you get a headset with microphone, a remote controller, power and audio cables. The system is very loud, and distinguishes microphone from the music very well. The final product we decided to review for you is really a “big boy” compared to other four. iSM1060BT is a three-part all-in-one karaoke machine that looks professional, sounds loud, and performs great. First thing to notice is the big 7-inch screen in the central unit, which will display the lyrics of your favorite song. The front panel is very spacious, and it features all the functions and settings for your audio. The usage on the user interface is intuitive and works well. The two big speakers are meant to be set on the both sides of the main unit, playing music as a 2.1 system. The build quality of the central unit and speakers themselves is great – the machine is robust, sturdy, and very stable (you can lean on it while in the mood). The music can be played through the machine cloud, supplied by the manufacturer, and you will pay $2 per song purchased. That is an one-time fee, and you keep the song forever. You can play your own music through USB or SD card as well. There is a HDMI port to connect the iSM1060BT to TV and display lyrics on a big screen. Perfect for parties. Two mics included are wired, so you’ll have to be careful while using. The system is pretty big and heavy (13.2 x 23.2 x 29.1 inches, 34 pounds all combined), but easy to assemble. With everything tested and compared, we didn’t have an easy task picking the winner. Each of the reviewed products had its own pros and cons, and each provided a decent set of performance and features to us. Our final recommendation would be Singtrix Party Bundle Premium Edition Home Karaoke System – #SGTX1. It provides the most for your money, its sound is great, and the features it brings can’t be matched by others. If you’re a beginner in hosting karaoke parties, this is a very good choice.